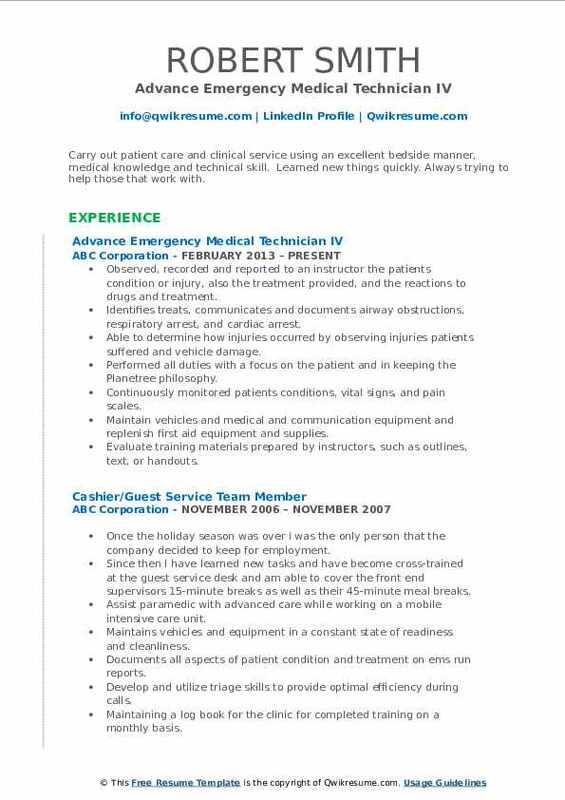 An Emergency Medical Technician will take responsibility for providing emergency medical attention for the injured and the sick. Apart from performing CPR, providing oxygen and other assistance to trauma victims, these Technicians will perform the tasks mentioned on the Emergency Medical Technician Resume – responding to emergency 911 calls, travelling to accident spot to provide emergency medical treatment, responding immediately to incidents such as heart attacks, slips and falls; assessing the patient’s condition, taking and monitoring vital signs, replacing used supplies, managing respiratory and cardiac problems, and administering medications orally and intravenously. 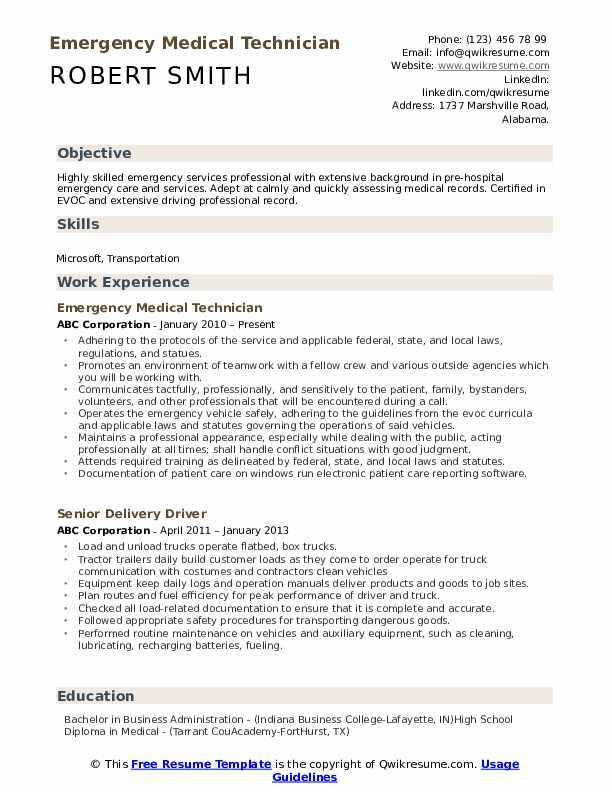 Skills that will highlight the resume include the following – keeping emergency vehicles clean and in working condition, physical stamina to move stretchers and lift patients, knowledge of CPR and First Aid; and social awareness. 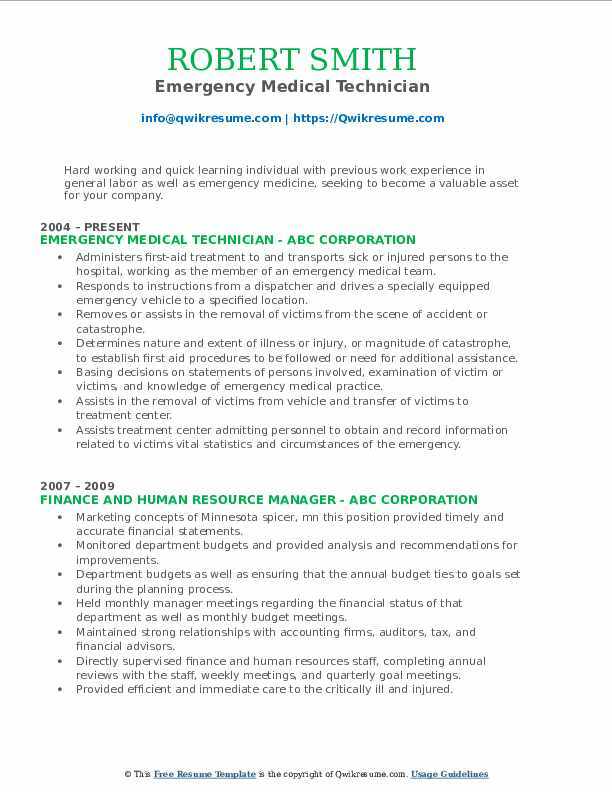 Job applicants should list a high school diploma and formal emergency training certification in the resume. 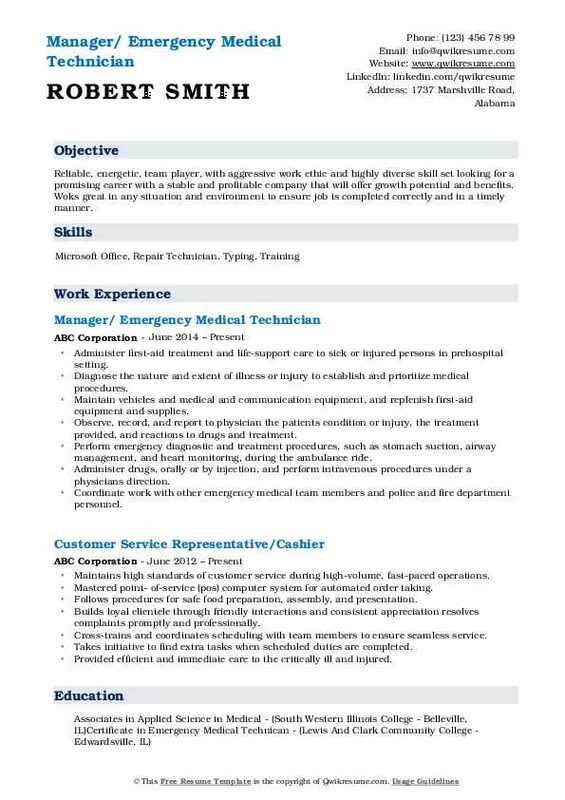 Summary : Highly skilled emergency services professional with extensive background in pre-hospital emergency care and services. Adept at calmly and quickly assessing medical records. Certified in EVOC and extensive driving professional record. Adhering to the protocols of the service and applicable federal, state, and local laws, regulations, and statues. Promotes an environment of teamwork with a fellow crew and various outside agencies which you will be working with. Communicates tactfully, professionally, and sensitively to the patient, family, bystanders, volunteers, and other professionals that will be encountered during a call. Operates the emergency vehicle safely, adhering to the guidelines from the evoc curricula and applicable laws and statutes governing the operations of said vehicles. Maintains a professional appearance, especially while dealing with the public, acting professionally at all times; shall handle conflict situations with good judgment. Attends required training as delineated by federal, state, and local laws and statutes. Documentation of patient care on windows run electronic patient care reporting software. 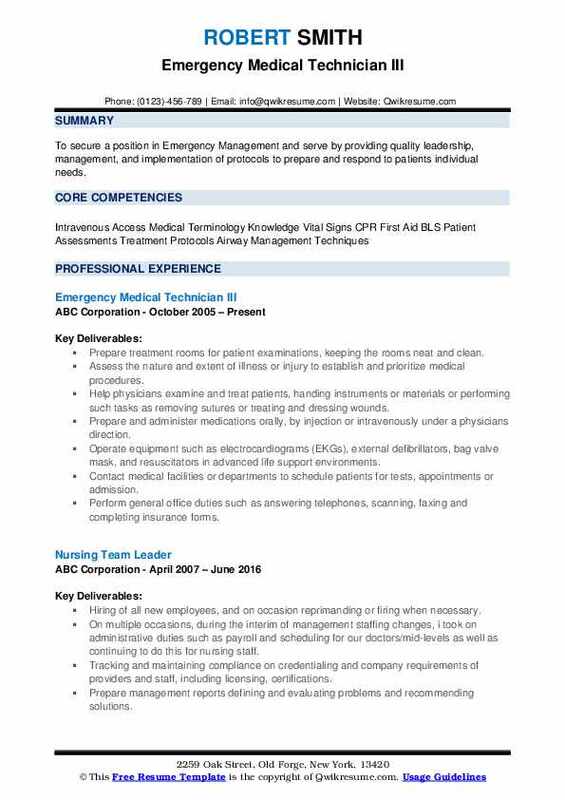 Summary : To secure a position in Emergency Management and serve by providing quality leadership, management, and implementation of protocols to prepare and respond to patients individual needs. Assess the nature and extent of illness or injury to establish and prioritize medical procedures. Help physicians examine and treat patients, handing instruments or materials or performing such tasks as removing sutures or treating and dressing wounds. Prepare and administer medications orally, by injection or intravenously under a physician's direction. Operate equipment such as electrocardiograms (EKGs), external defibrillators, bag valve mask, and resuscitators in advanced life support environments. Contact medical facilities or departments to schedule patients for tests, appointments or admission. Perform general office duties such as answering telephones, scanning, faxing and completing insurance forms. Keep financial records or perform other bookkeeping duties such as handling credit or collections, mailing monthly statements to patients. 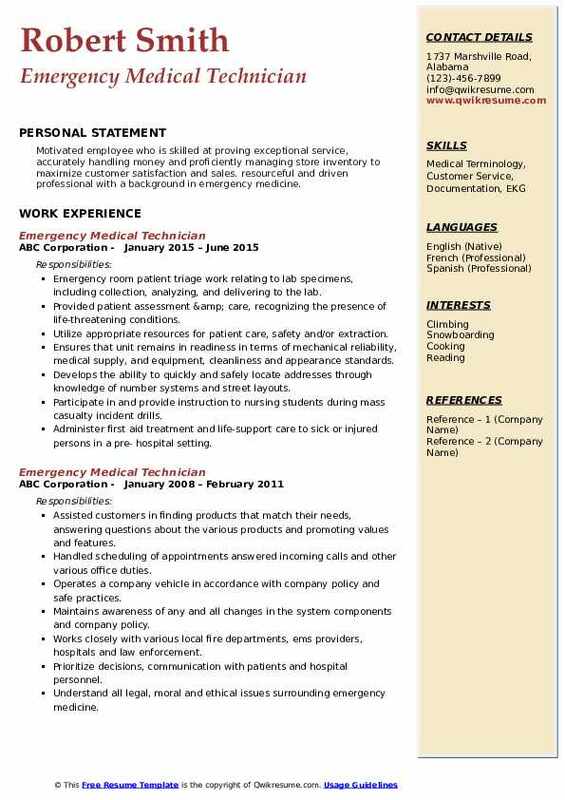 Objective : Nationally Registered Emergency Medical Technician (EMT) with over 3 years of basic EMT and medical experience. I have previously worked as lead corrections officer in a juvenile facility. 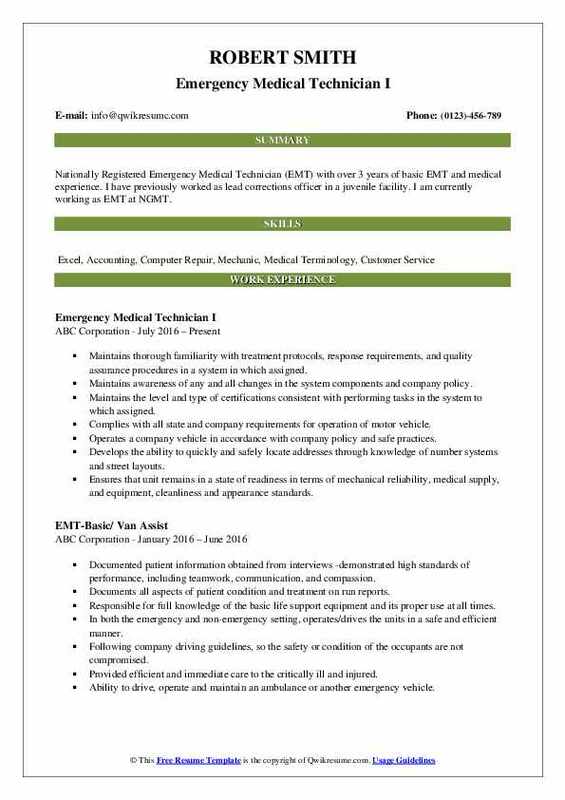 I am currently working as EMT at NGMT. Maintains thorough familiarity with treatment protocols, response requirements, and quality assurance procedures in a system in which assigned. Maintains the level and type of certifications consistent with performing tasks in the system to which assigned. Develops the ability to quickly and safely locate addresses through knowledge of number systems and street layouts. Ensures that unit remains in a state of readiness in terms of mechanical reliability, medical supply, and equipment, cleanliness and appearance standards. Reports immediately to the lead paramedic any discrepancies in vehicle or equipment standards that could compromise the unit's ability to complete a call. Summary : Carry out patient care and clinical service using an excellent bedside manner, medical knowledge and technical skill. Learned new things quickly. Always trying to help those that work with. Observed, recorded and reported to an instructor the patient's condition or injury, also the treatment provided, and the reactions to drugs and treatment. Identifies treats, communicates and documents airway obstructions, respiratory arrest, and cardiac arrest. Able to determine how injuries occurred by observing injuries patients suffered and vehicle damage. Performed all duties with a focus on the patient and in keeping the Planetree philosophy. Continuously monitored patient's conditions, vital signs, and pain scales. Maintain vehicles and medical and communication equipment and replenish first aid equipment and supplies. Headline : Highly motivated professional committed to quality patient care and professional development by obtaining professional certifications and attending technical training sessions. Maintain awareness of any and all changes in the system components and company policy. Headline : Reliable, energetic, team player, with aggressive work ethic and highly diverse skill set looking for a promising career with a stable and profitable company that will offer growth potential and benefits. Woks great in any situation and environment to ensure job is completed correctly and in a timely manner. Administer first-aid treatment and life-support care to sick or injured persons in prehospital setting. Diagnose the nature and extent of illness or injury to establish and prioritize medical procedures. Perform emergency diagnostic and treatment procedures, such as stomach suction, airway management, and heart monitoring, during the ambulance ride. Administer drugs, orally or by injection, and perform intravenous procedures under a physician's direction. Coordinate work with other emergency medical team members and police and fire department personnel. Summary : Hard working and quick learning individual with previous work experience in general labor as well as emergency medicine, seeking to become a valuable asset for your company. Administers first-aid treatment to and transports sick or injured persons to the hospital, working as the member of an emergency medical team. Responds to instructions from a dispatcher and drives a specially equipped emergency vehicle to a specified location. Removes or assists in the removal of victims from the scene of accident or catastrophe. Determines nature and extent of illness or injury, or magnitude of catastrophe, to establish first aid procedures to be followed or need for additional assistance. Basing decisions on statements of persons involved, examination of victim or victims, and knowledge of emergency medical practice. Assists in the removal of victims from vehicle and transfer of victims to treatment center. Assists treatment center admitting personnel to obtain and record information related to victims' vital statistics and circumstances of the emergency. Maintains vehicles and medical and communication equipment and replenishes first-aid equipment and supplies. 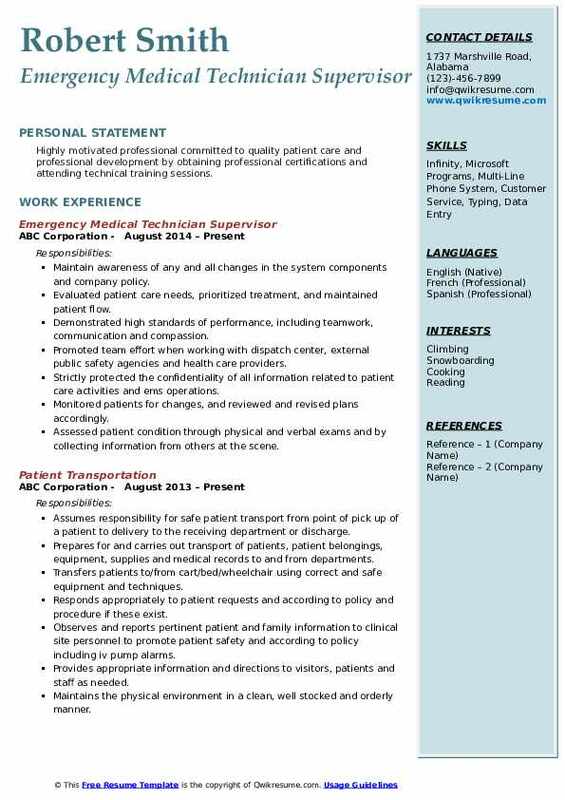 Objective : Medical Assistant/Trainer with Patient First attitude. In my current position, work with training the new employees in the many facets of Patient First, from how we handle patient care to how we handle patient records, and all that falls in between. Performed emergency room operations in a hospital setting under the supervision of a nurse or doctor. Operated as a basic life support unit for a private ambulance company providing modes of transport. Occasionally on board the critical care transport unit assisting cut nurse during transport with patients who require 24-hour monitoring. Work directly with doctors, nurse, and hospital staff, transferring patient care and sensitive material while operating within scoop of practice. Constant assessment patient en route to emergency facility administered additional care as indicated or directed by medical direction. Reported, verbally and in writing, the observation and emergency medical care of the patient at the emergency scene and in transit to the receiving facility staff for purposes of records and diagnostics. Provided efficient and immediate care to the critically ill and injured. Headline : Motivated employee who is skilled at proving exceptional service, accurately handling money and proficiently managing store inventory to maximize customer satisfaction and sales. 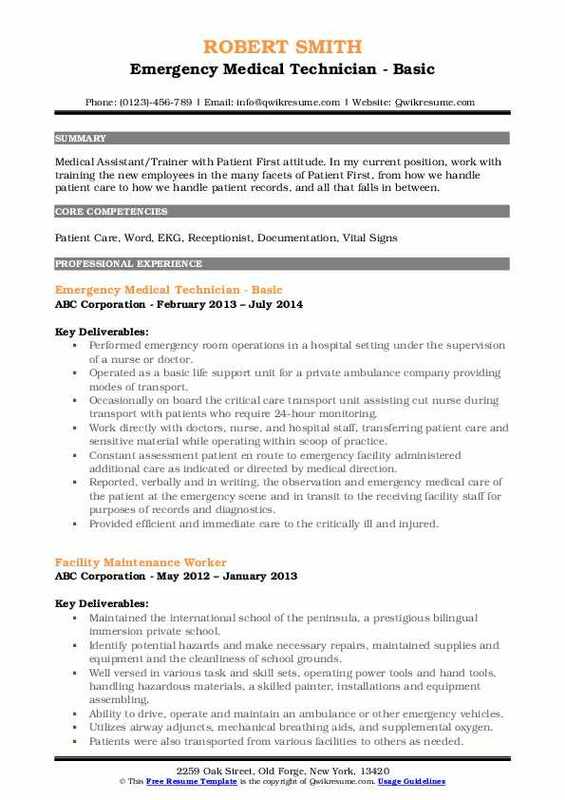 resourceful and driven professional with a background in emergency medicine. Emergency room patient triage work relating to lab specimens, including collection, analyzing, and delivering to the lab. Provided patient assessment & care, recognizing the presence of life-threatening conditions. Utilize appropriate resources for patient care, safety and/or extraction. Ensures that unit remains in readiness in terms of mechanical reliability, medical supply, and equipment, cleanliness and appearance standards. Participate in and provide instruction to nursing students during mass casualty incident drills. Administer first aid treatment and life-support care to sick or injured persons in a pre- hospital setting. 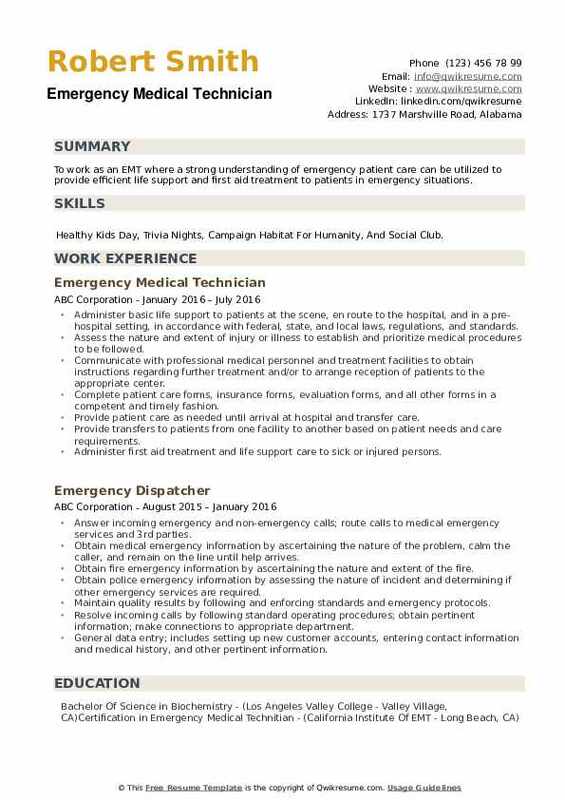 Objective : To work as an EMT where a strong understanding of emergency patient care can be utilized to provide efficient life support and first aid treatment to patients in emergency situations. Skills : Healthy Kids Day, Trivia Nights, Campaign Habitat For Humanity, And Social Club. Administer basic life support to patients at the scene, en route to the hospital, and in a pre-hospital setting, in accordance with federal, state, and local laws, regulations, and standards. Assess the nature and extent of injury or illness to establish and prioritize medical procedures to be followed. Provide patient care as needed until arrival at hospital and transfer care. Provide transfers to patients from one facility to another based on patient needs and care requirements. Administer first aid treatment and life support care to sick or injured persons.